Your child has reached the age of 9 and really is a proficient reader. Congratulations! And whew! That means no more needing to read to that kid. Right? 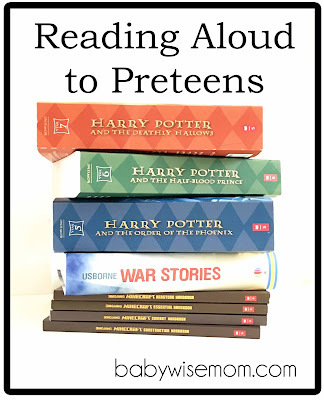 You absolutely can read aloud to your preteen. Not only can you, but if you do, your preteen will enjoy many benefits. The child has enjoyable reading time each day. As students get older, reading gets tested more and more. Reading aloud with a parent, and not getting tested, is just purely reading for fun. The child also enjoys reading because he is spending time with a parent. You are sharing something together. Reading to your child is like advertising the pleasure of reading. Children can understand a higher reading levels than they can read. Until 8th grade, children read and listen on different levels, and listening is higher (see page 37). “…children can hear and understand stories that are more complicated and more interesting than anything they could read on their own…” (page 37). Reading a higher level than the child can read helps build vocabulary. It helps improve grammar–“Grammar is more caught than taught…By hearing the language spoken correctly, you begin to imitate the pattern–both in what you say and in what you write” (page 41). You can expose your child to classics at a much younger age. Kaitlyn is 8 and I am currently reading Charles Dickens to her. She would struggle to understand the book on her own. With me, she can get used to the language used. She can ask what words and phrases mean. I can stop every so often and talk with her about what is happening. I personally didn’t read Dickens until high school. She is getting exposure to classics at a much younger age. Now of course, you do want to be prudent in choosing books–make sure the content is something your child can handle emotionally and on a maturity level. Just because you can read it doesn’t mean you should. Oh believe me that I know that reading aloud to each of your children takes a long time. You would LOVE to be able to send your preteen to bed without having read to the preteen as well as all of your other children. This post contains affiliate links. Jim Trelease points out in the Read Aloud Handbook that “Parenting is not supposed to be a time-saving experience. Parenting is a time-consuming, time-investing–but not time-saving.” (page 40) Reading aloud to your child each night is a best way of spending your time. Three Year Old: Each day before her nap, I read to Brinley aloud. Each night before bed, my husband reads aloud to Brinley. She gets double reading each day. She also spends her 60-90 independent playtime listening to books on CD (which have been put onto an iPod ). Six Year Old: As Nate is reading to Brinley at night, McKenna is being read to. She is either being read to by Brayden or me. Eight Year Old: At the same time, Kaitlyn is being read aloud to by either Brayden or me. We alternate. As soon as I finish a novel with one girl, I start with the next girl the next night. Ten Year Old: Brayden is older and has lower sleep needs overall than all of our girls. Once all of our girls are read to and put to bed, Nate reads to Brayden. We used to alternate who read to him, but Nate always reads to Brayden now. It is a special father/son thing they do each day. Once Brinley is done with naps, I think we will alternate who is reading to Brinley at night and who is reading to the other two girls so that they all get time read with everyone. For now, this is what works for us. I really encourage you to continue to read aloud to your preteens. When I was in seventh grade, that is when reading books started to become a heavily tested thing at school. I went from reading about 50-60 books a month to half that. By the next year, I really only read what was required of me at school. During summers, I would read some. I was in honors English and AP English classes. I had a lot of reading, but it was never for pleasure. I continued this pattern through college. It wasn’t until I graduated from college that I resumed reading for pleasure. I, fortunately, never lost that love of reading, though I did shelf it for a long time. Reading aloud to your children at the very least provides a moment of reading for fun each day. Are Book Series Beneficial or Harmful to Reading Skills? I would love to know some titles of books on Cd that you read to Brinley. I have been wondering about getting some for my three year old.